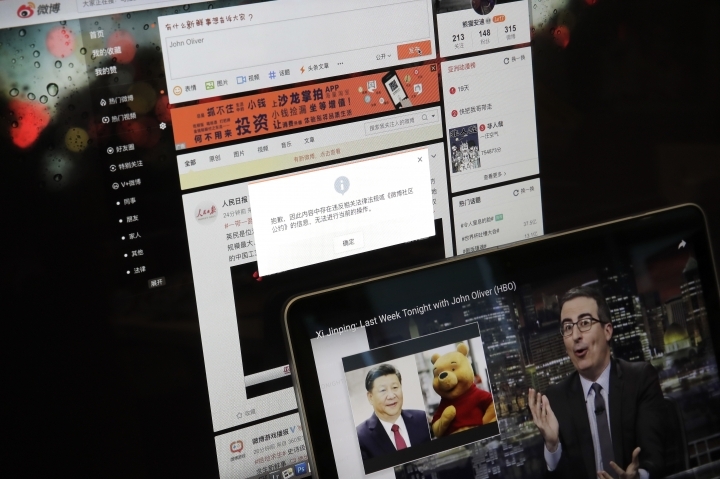 BEIJING — A popular Chinese social media site is censoring discussion of "Last Week Tonight" and its HBO host John Oliver after he mocked Chinese President Xi Jinping, his apparent sensitivity about being compared to Winnie the Pooh and his country's crackdown on human rights. Attempts to send posts with either the terms "John Oliver" or "Last Week Tonight" on the Sina Weibo microblog Friday were met with failure messages saying "the content contains information that violates relevant laws and regulations." Oliver's show on Sunday made satirical references to Xi and the way that Chinese internet users often joke that he resembles Winnie the Pooh. The show also referred to China's internment of hundreds of thousands of members of the Muslim Uighur minority groups in political indoctrination camps . Oliver called Xi "the man who is now emperor for life," referring to the Chinese leader's power grab earlier this year when presidential term limits were eliminated. On YouTube, the video of the 20-minute segment was viewed more than 3.3 million times by Friday. The show also turned a critical eye to Xi's signature anti-corruption crackdown that has ensnared political rivals and his hallmark program of overseas infrastructure projects known as the "Belt and Road" initiative. Oliver's show included a parody of a propaganda music video made to promote the initiative in which children sing about China being an autocracy that abuses its citizens' human rights. "This is the China Xi doesn't want you to see," they sing in chorus. It also discussed moves to build up a cult of personality around Xi, the ruling Communist Party's attacks on human rights campaigners and the death of Nobel Peace Prize laureate Liu Xiaobo last year while serving a prison term for subversion. The censoring of social media posts was the latest sign of the country's increasing sensitivity over political content and satire. China maintains some of the world's toughest restrictions on content online as well as on foreign news and entertainment broadcasters such as HBO. Weibo did not immediately respond Friday to a request for comment. The Life Voyager puts travel news into perspective, bringing you unique and secluded side to popular travel destinations you never know exist. Copyright © 2015 - 2019 The Life Voyager. All Rights Reserved.